When Filipinos cook stir fried noodles the main ingredient would be either pork or chicken and we rarely use seafood specially fish, might be because we are used to eating our seafood as it is and rarely filleted, so we barely see fish fillets in supermarkets and if you want one you have to ask for it or fillet it on your own. But when I worked in Hong Kong I was exposed to noodle dishes that used seafood and fish as their main ingredients and they taste really good so good I there was one instance I ordered them almost every day for a week, I like noodles and I really love seafood and combining them together would be heaven. So this dish will be similar to the Filipino dish called pancit canton but using seafood instead of the traditional chicken or pork. In a wok, add oil then quickly fry shrimps, crab sticks and squid for around 2 minutes, remove from wok then set aside. Pan fry fish fillets next then set aside. Sauté 1/2 of minced garlic, onions and celery then add cabbage and carrots stir fry for 2 minutes, drain vegetables keep it aside while leaving any liquid in the wok. Add remaining garlic, saute for 30 seconds then add seafood stock, soy sauce and bring to a boil. Add the fresh noodles while constantly stir frying, add more stock if noodles is drying out. Do this for 3-5 minutes. Add the cooked vegetables and seafood, mix to distribute evenly. Season with fish sauce and pepper then serve. Fantastic meal Raymund – I love seafood and this is a great way to prepare it. I love beautiful food! This looks amazing! and very flavorful too. I like this seafood version Raymund, you know my hubby does not eat chicken and pork so, this will be perfect to be made for him. Noodles are what I do especially for a quick meal. Lovely photo, I like how the purple and red highlight the shrimp. Yum! I love Pancit and like you also love to make it with seafood. I love the picture! Oh I love this one. Wait do I say that every time? I know what you mean, back in Greece there are no fish fillets also. Lovely stir fry, I dont have any noodles if I had I could have it today..
Last time was Pad Thai and now this seafood stir fried noodles! So irresistible not to knock on your door…. Good thing I live far. 😉 Your family is so lucky to have a great chef in the house! I love this recipe the noodle is fav my family, thanks for share. Loving your last few dishes Raymund. Look at those shrimp! Yum! Please, I want some of that! 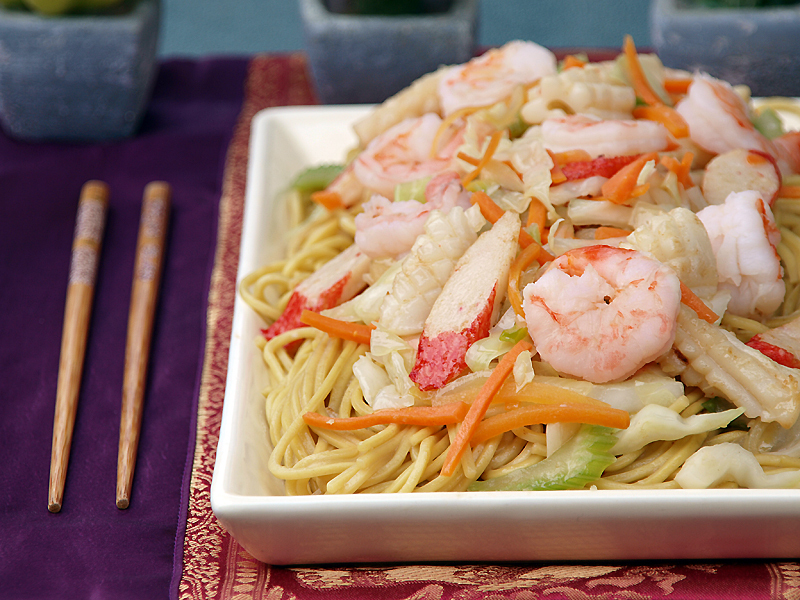 I agree that seafood and noodles make a yummy combination. Ooh braising the noodles in seafood stock would make the dish so tasty. My family would go crazy for this dish. Plus it looks so fun and colorful on the plate.